Santa Cruz Island off the California coast. Looking west towards Santa Rosa Island in the background. Photo: National Park Service. The first thing I noticed was the quietness. Standing on the cliff at the west end all I heard was the wind blowing off the ocean, the waves crashing on the shore, the gulls screaming in the air, all mixed with the smell of the sea. No cars, no trucks, no sounds of civilization. It was truly a magical place, an island lost in time. It was the California of old and of a time before that. You could feel it and see it. It wasn’t hard to imagine yourself standing on the same cliff in 1950, 1850 or even 5000 BC. Since it has been privately “owned” for hundreds of years it is one of the last undeveloped coastal areas in California, along with rest of the northern Channel Islands; imagine Santa Barbara with no homes, no highways, no people. But in some ways, it was a sad place. It felt empty. A bountiful island that had been stripped of its riches, plundered beyond recognition. A haunting beauty. 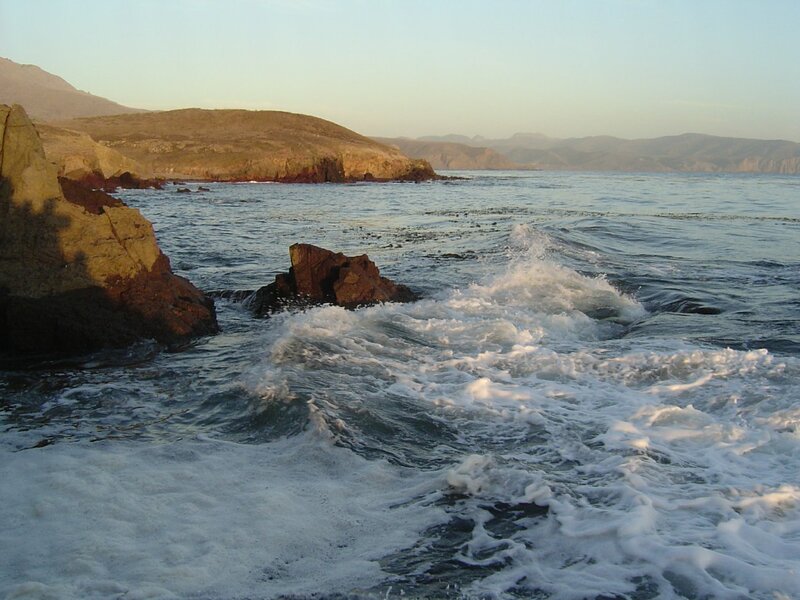 The Chumash called her Limuw (“in the sea”) — the source of their creation — but most know her as Santa Cruz Island. I don’t remember the first time I saw her, but it must have been on a trip through Santa Barbara in the 1960s or 70s where you see the island off in the distance, a silhouette against the vast ocean. An apt metaphor for an island lost in time. I do, however, vividly remember my first visit to the island, in 1979 with my friend Frank Dorenkamp on his sailboat. We crossed the channel to Smuggler’s Cove and snorkeled on the east end of the island for abalone. I’ll have never forgotten it. First I saw a few black abalone, then I realized the bottom was literally covered with them. As I dove down again I noticed a bunch of green abalone sightly deeper, awash in kelp. Grabbing a breath and going back down I started to grab a few greens then I noticed pink abalone everywhere. It was abalone heaven. West end, Santa Cruz Island at sunset. Photo: Brian Tissot. Flash forward seven years to 1986 and I am driving on the island out to the west end to start my dissertation research on black abalone. Although I returned for the abalone I have received so much more on my 25 trips over 17 years to the island. And in that time I came to know that island, as much as anyone can know a place just be visiting a week or two at a time, and its story is now part of my life, forever embedded in my consciousness. I can go there anytime in my head as it is imprinted it in my mind. The rolling hills, the cliffs, and beaches, the wind. Timeless. 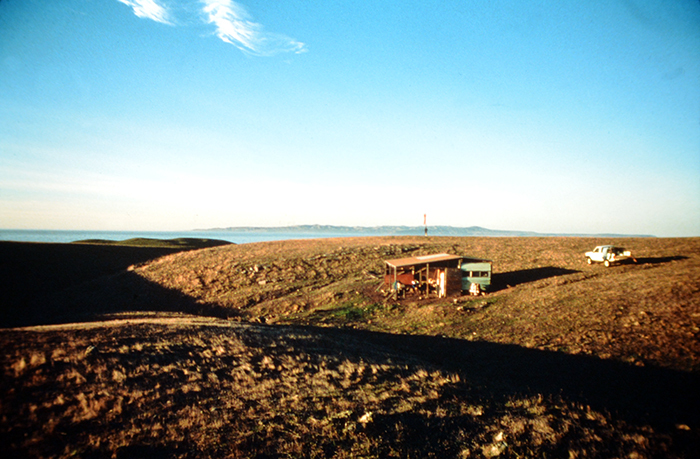 The west end trailer: our home base during abalone surveys in the 1980s and 90s. Photo: Brian Tissot. happy. There was plenty of fish and plants to eat. Before I even set foot on the island I knew this place. I knew it from the story of the Island of the Blue Dolphins which I read when I was young. And I had imagined it was Limuw (we know now that the true story on which the book was based was actually San Nicholas Island). But Liumw lived up to that name: in many of our trips to the island, we would encounter a large school of dolphins as we approached the island near Prisoner’s Harbor. And according to the legend of the Rainbow Bridge, these dolphins were their brothers and sisters, Chumash who fell into the ocean while crossing a rainbow from Limuw to the mainland that were turned into dolphins. 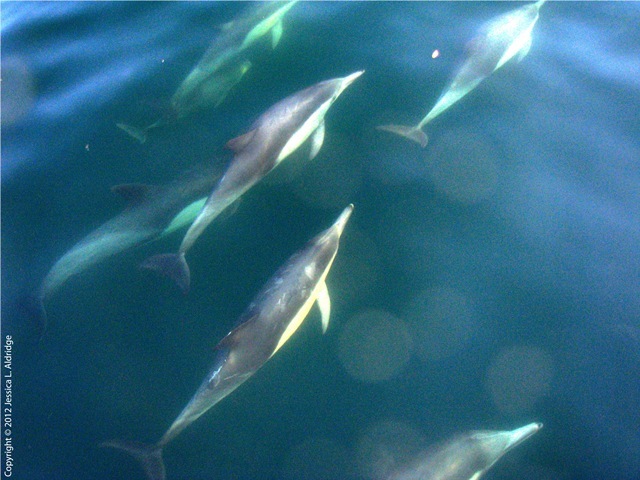 We often encountered dolphins on our way to the island. According to legend, Chumash who fell into the ocean while crossing the rainbow to the mainland were turned into dolphins. Photo By Jessica Aldridge. The Chumash tribe has a long, long history on the island, having lived there for at least 10,000 years. You could feel and see their presence. House pits and shell middens dotted the coastline, focused in areas of access to rich marine resources. It wasn’t difficult to imagine people walking on the beaches, foraging along the shore. In one dream on the island, I envisioned a series of traditional Chumash houses dotting the coast, smoke pouring out of the huts and blowing offshore in the wind. Prior to western contact, there were 10 villages and perhaps as many as 1,200 people living on the island. Among native Americans the Chumash had one of the most complex political systems of any tribe, much of it focused on the lucrative bead trade, for which they had a monopoly (Arnold, 2001). It was simply a timeless place. 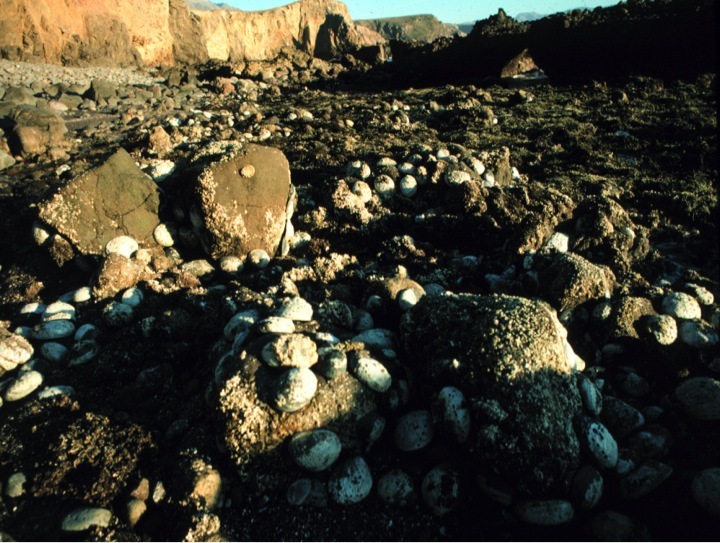 But also haunting, because now the Chumash were gone, banished from the island in 1822, and all that remains are the middens from their houses: hundreds and thousands of years of accumulated shells, bones and household remains. The remnants of countless lives and their daily meals marked by the mounds. And now there is a race with time as rising sea levels from human activities are eroding these timeless treasures into the ocean. Along with the Chumash, sea otters, which were once plentiful offshore, were hunted nearly to extinction and were mostly gone from the Channel Island by the early 1800s. The effects of the removal of these two predators created an imbalance, amplified by many other profound changes, that has reverberated through the island’s ecology and fundamentally altered the landscape. The island itself has changed hands many times and resulted in further changes on the island. After the Chumash removal “ownership” was granted to Andrés Castillero in 1839 as part of a Mexican Land Grant. Castillero sold the island to William Barron — a San Francisco businessman — in 1857 who ran a sheep ranch and imported cattle and horses to the island. From Barron, the island passed to Justinian Caire who continued ranching on the island. But domestic squabbles and an eventual lawsuit by Caire’s daughters resulted in the division of the island and the forced sale of most of it in 1937. Caire’s son-in-law, Ambrose Gherini, retained part of the east end of the island on which they continued their sheep ranching operation, but the remaining 90 percent of the island was sold to LA oilman Edwin Stanton in 1937 who shifted from sheep to cattle ranching. When I first visited the island in 1986 most of the island was owned by Carey Stanton, Edwin’s son, and it was still a working cattle ranch. After Carey Stanton died suddenly in 1987 the land passed to the Nature Conservancy by prior agreement and they quickly eliminated the cattle operation and began efforts to restore the island back to its natural state. 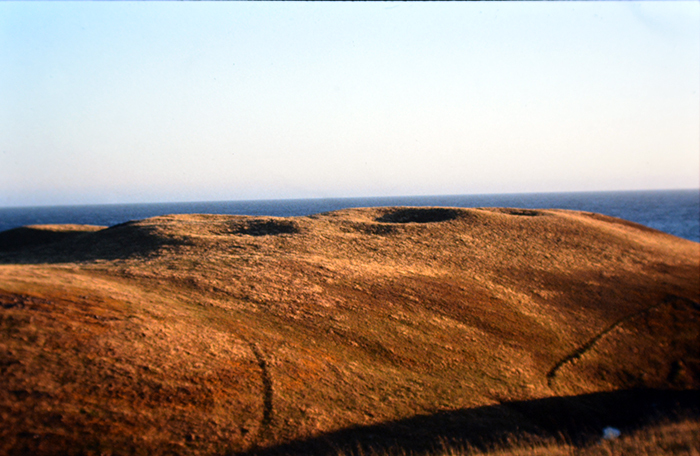 The east end of the island, after several decades of negotiation, was eventually purchased by the National Park Service and became part of the Channel Islands National Park, created in 1980. These shifted operations had profound negative effects on the terrestrial ecosystem. Although feral sheep were removed from the western portion of the island in the 1980s, feral pigs (probably introduced by Spanish explorers) remained as a serious ecological problem. Pig rooting causes massive destruction of native species, causes erosion, damages archaeological sites, and ultimately attracted new predators, golden eagles, which used to be excluded by the primarily fish-eating bald eagles (eliminated around the island in the mid-1950s by DDT). Because piglets provided a year-round food source for golden eagles, they grew in abundance on the island and began to prey on the endemic island foxes. Since the island foxes had no previous experience with these predators they were easy prey for the Eagles and they declined by 95% within a decade. Golden eagle predation pushed the fox to the brink of extinction on Santa Cruz, Santa Rosa, and San Miguel Islands and they were listed under the Endangered Species Act in 2004. Similar profound changes were also occurring in the marine ecosystem around the island. In response to the elimination of natural predators (primarily the sea otter in the early 1820s) abalone populations increased dramatically and eventually became a major commercial target. 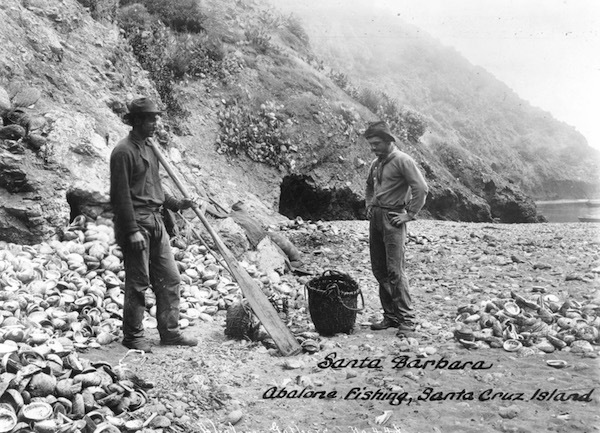 The first non-Native American group to exploit abalone on the island were Chinese fisherman who began setting up camps in the late 1880s and harvested mostly black abalone (Haliotis cracherodii) from shore (Lundy, 1997; Braje et al., 2007). After the Chinese, Japanese divers continued the fishery by diving in deeper waters for red abalone (H. rufescens) which eventually gave way to the large-scale commercial fisheries in the 1930s. Chinese abalone fishery on Santa Cruz Island, late 1800s. During its heyday in the 1950s and 1960s, the commercial abalone fishery peaked by harvesting over 4 million pounds (about 2-3 million abalone) per year (Lundy, 1997, Cox 1960). Then, as stocks declined they did what many fisheries do: they switched species. First to pinks (H. corrugata), then greens (H. fulgens), then whites (H. sorenseni) and finally to black abalone. Abalone stocks continued to decline into the 1980s but commercial fisheries could not harvest black abalone in shallow water so they were still very abundant along the shores. When I started my research in 1986 blacks were so abundant they carpeted the landscape in the intertidal zone. It was truly an amazing sight. But it didn’t last. I didn’t know it at the time but abalone had been infected by a pathogen (a bacterium) and beginning in 1987 they began to sharply decline. Over the three years of my dissertation research, I documented 99% declines in eight distinct areas on the west end of the island. And it wasn’t just on Santa Cruz Island but on the other northern channel islands as well. Eventually, it spread to all the islands and up the California coast as far as Cayucos. In 2009 black abalone were listed on the Endangered Species List, in part using data from my studies on the island (Newman, Tissot, and VanBlaricom, 2010). As I returned to my study sites into the 1990s and 2000s my study sites were remarkably bare. Where thousands of abalone had once lived there were now a few here and there; the once carpeted shorelines now devoid of their ubiquitous presence. There were also profound changes occurring underwater off the island. Most of the west end had thick kelp beds, rich with fish, harbor seals and an occasional red and pink abalone. However, sea urchins had been taking over the bottom due to the demise of sea otters, and continued sport hunting of their other predators — such as Sheepshead and spiny lobsters — including mass mortality of sunflower sea stars in the early 1980s from a disease. Offshore of my abalone sites on the west end the bottom was dominated by sea urchins “barrens” which mowed down the kelp, eliminating refuge and food for the myriads of fish and invertebrates, and created a low-diversity ecosystem. Going diving on the west end, 1989: Me (left) with Peter Van Tamalen (right). Entries were often difficult but the kelp beds offshore were spectacular. Photo: Susan Tissot. Underwater at Santa Cruz island. Kelp Bed (left) Photo: Scott Gietler. http://www.uwphotographyguide.com/channel-islands-diving. Urchin barrens (right). Photo: National Park Service. 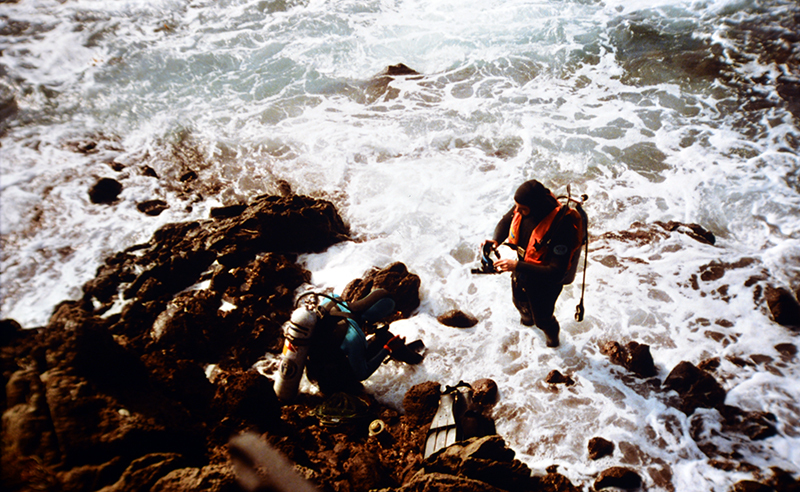 And for 13 years after I received my PhD I returned to the island to record the changes. Where I once counted over 2,100 abalone I found 5 in 1995 and 1 in 2003. But during my trips it was hard not to notice other changes on the island: the old trailer I lived in was hauled away in the 1990s due to the increasing threat of Hantavirus in deer mouse; the island foxes that used to visit us disappeared; and everywhere there were more pigs, more land disturbed by their rooting, and an eroded landscape. The changes continued. In 1999 I awoke in the middle of the night to bright lights on the horizon. As I looked offshore I observed a large fleet of squid boats that had moved in during the night and were stretched out for miles along the island with their bright lights and roaring engines pulling in the squid. In 2000 the California fishery pulled in 248 million pounds of market squid with at least 20 million pounds from Santa Cruz Island area alone. The fishery had found a new target. Squid Boats offshore, lighting up the coast at night. And on those last trips, I experienced a profound sadness when I visited the island. When I looked along the shores, empty of otters and abalone; in the kelp forests, devoid of fishes and lobsters; at the torn-up landscape, empty of foxes; along the cliffs with the remnants of the Chumash culture crumbling into the sea, it felt empty, desolate, devastated. It felt haunted by what had lived there before. The natural timeless beauty of the island, all banished by (western) human exploitation and its side effects. A place out of balance, struggling, as if the land or ocean can struggle, to find a new equilibrium. But there was none to be found. For here was an island in the human stream: one where there were no homes, no subdivisions, no paved roads and only a few people who actually lived on the island. Yet, we still managed to fundamentally alter the island’s ecology. Is there no hope in the world for any remaining wilderness? But yet hope springs eternal and since my last visit in 2003, some amazing events have occurred due to hard work by lots of people. Feral pigs were eradicated from the island in 2005 and bald eagles were reintroduced in 2002. As of 2013, there were five breeding eagle pairs on Santa Cruz Island and once again they are an important part of the island’s ecosystem (check out the Bald Eagle cam!). As a result, no golden eagles have nested on the island since 2006. After the island fox declined to around 100 individuals a captive breeding program was begun in 2002 and 85 pups have been produced and released on the island. Current population estimates stand at 1,600 individuals and the US Fish & Wildlife Service has proposed taking the island foxes off the endangered species list (this happened in 2016). And the landscape is recovering too: native plants are flourishing and are re-vegetating the formally barren or fennel-infested hillsides. The island is returning to its natural state, however slowly. In 2004 the Chumash returned to the island after 130 years. 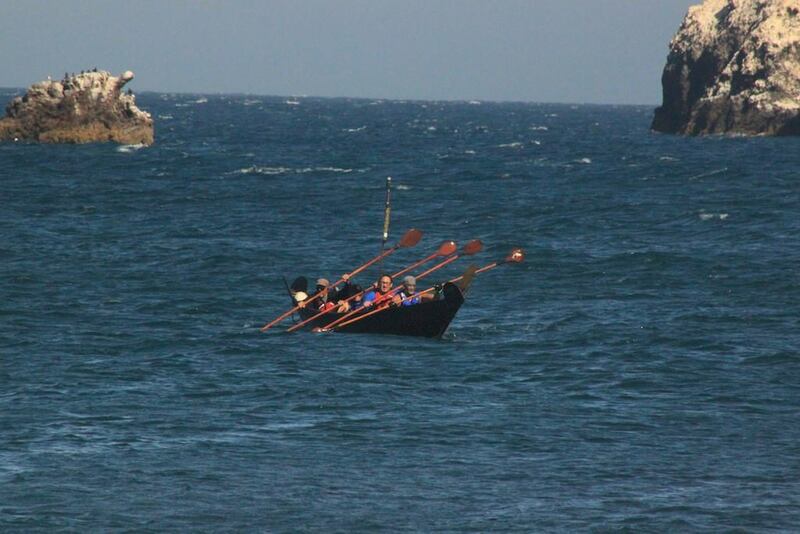 A crew of paddlers from the Chumash Maritime Association paddled using a traditional watercraft (Tomol) from Channel Islands Harbor to Scorpion Bay for ten hours to complete the journey of over twenty miles. As the Tomol was used to connect the islands and the mainland, this crossing was designed to link past generations of Chumash with the present-day Chumash community. Since then there have many crossings and it has become a tribal tradition. [watch a video of their journey]. And in the sea, both the state of California and the Federal government created thirteen Marine Protected Areas (MPAs) within the Channel Islands National Marine Sanctuary in 2003 and 2007, respectively. These MPAs form a network that protects 21% of sanctuary waters and consists of 11 marine reserves where all fishing is prohibited and two marine conservation areas that allow limited take of lobster and pelagic fish. After 10 years of research my colleague, Dr. Jenn Casell, has found significant increases in the number and biomass of kelp forest animals in these MPAs, including spiny lobsters which now eat more urchins and have helped to promote healthier, more resilient kelp forests (PISCO). Meanwhile, sea otters have recovered from historic low populations and in 2015 the three-year average of the population reached 3,054 animals — the highest ever. Moreover, the otters have spread south as far as Gaviota in Santa Barbara and are predicted to recolonize the northern channel islands in the next decade or so (Tinker et al., 2008). And most surprising of all, black abalone began to come back in 2008 (Richards and Whitaker, 2010) and have <href=”https://caseagrant.ucsd.edu/news/black-abalone-recruiting-on-channel-islands&#8221; target=”_blank”>begun to recruit to the island again in 2013 and are starting to repopulate some of their former areas. Of course, they have a long way to go, and may never return to their former “carpet-like” glory but the change is very encouraging. This place is so special. It is simply perfect in every way. I’m sitting on a rock on the edge of the intertidal watching the waves splash in. It feels so clean, so right. each roll of a boulder, each call of a gull. The salty spray is clean and heady. Its brisk aroma alive. The sights of the island off in the distance. The long sharp lines of the cliff and rock. The waves crashing over rocks and into cliffs. The swell rising out of the glittering sea and kelp. Crashing over in thunderous roar. The heavy silence between waves when all is still. This rhythm is part of who I am. It is in me, in my blood and in my soul. No matter where I am I carry this with me. I owe so much to Lyndal Laughrin who was my guide and my inspiration during my many trips to the island. Besides keeping me on the “good roads” he provided valuable support for our work on the west end. Arnold, J. E.(Editor). 2001. The Origins of a Pacific Coast Chiefdom: The Chumash of the Channel Islands. University of Utah Press. Arnold, J. E. and B. N. Tissot. 1993. 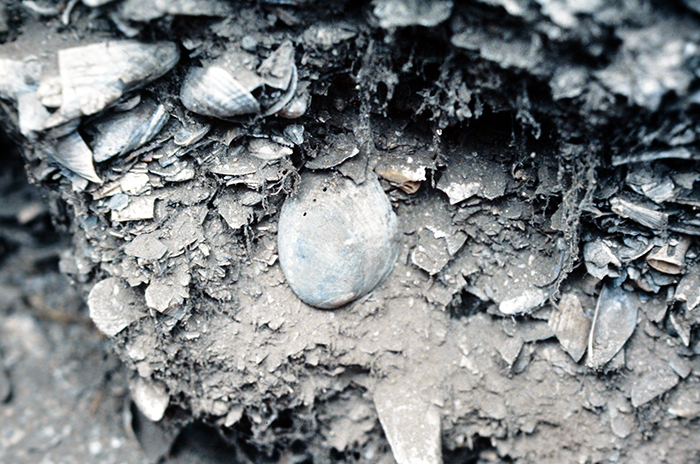 Measurement of significant marine paleo-temperature variation using black abalone shells from prehistoric middens. Quaternary Research 39: 390-394. Braje, T. J., J. M. Erlandson and T. C. Rick, 2007. An historic Chinese abalone fishery on California’s northern Channel islands. Historical Archaeology 41(4): 117-128. Cox, K. 1960. California Abalones, Family Haliotidae. California Fish and Game Bulletin 118. 130 pp. Lundy, A. L. 1997. The California Abalone Industry. Best Publishing Company, 223 pp. Newman, M. Tissot, B. N. And G. VanBlaricom. 2010. Overall status and threats assessment of black abalone (Haliotis cracherodii Leach, 1814) populations in California. J. Shellfish Res. 29(3): 577-586. Tinker, M. T., D. F. Doak, and J. A. Estes. 2008. Using demography and movement behavior to predict range expansion of the southern sea otter. Ecological Applications 18(7) 1781-1794. ← What if Life Chooses you? Thank you for your dedication, and for making this info and pics available! Blessings! On my first surf trip to Central Baja in winter 1984 we enjoyed eating the plentiful black abs. On subsequent trips there will still plenty. Then I too saw what I can only describe as a total disappearance. I have traveled the coastline yearly since. 3 years ago I noticed quite a few small blacks. I counted 23 in a prime habitat area consisting of about 100 yards of coastline at a negative tide. I very much enjoyed your article.